Syflex is an extremely fast cloth simulator with a simple user interface. For instance on an intel i5 (quad-core, 3.1GHz) a 10.000 vertices cloth with 16,000 vertices collision object runs at 25 fps. Syflex now allows to sew flat panels together to model even more realistic clothes. Here are animations that users quickly created using Syflex in Lightwave. They illustrate what the plugin can do. 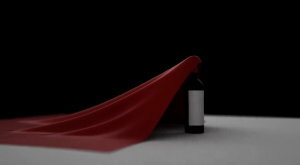 Wine-derful animation from Vincent Paris at Le Jardin Digital. 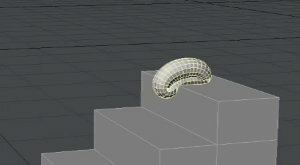 Vincent used a hidden (not renderable) object for the collision. This is often a good solution, as the object used for rendering might require a higher resolution. PS: Yes, this is a Bordeaux. 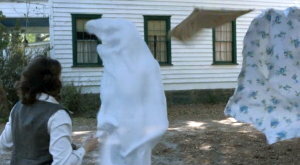 Realistic animation from David Ridle for a scene of the movie The Conjuring. He used wind and an invisible geometry. Don't miss the wireframe rendering: it explains how the animation was done. 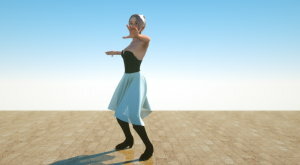 A cloth simulation gallery always includes a Dancing Girl. Thank you Joseph Hinrichs! Steve White shows that Syflex can also be used for soft bodies. 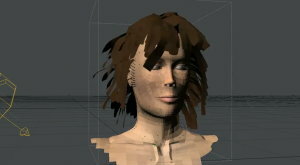 You can see in the demo that the simulation is not pre-computed, but is instead computed on the fly, allowing the artist to tweak the parameters. Hair animation from Vincent Paris, using flat strands. "Syflex is really a nice extension to Lightwave, with exactly what I have been waiting for this kind of plugin: extremely simple to use, powerful and stable. It is astounding to see how so few parameters are doing such a great job!" Copyright © 2002-2014 Syflex LLC. All rights reserved.